Patients who are missing several or a full row of teeth in the upper or lower jaw should seek replacement as soon as possible. Tooth loss takes a real bite out of your quality of life, and issues like eating, chewing, and speaking are all associated with gaps in the smile. Dr. Alex Goodman and our team provide full and partial dentures in Columbia, TN. The sturdy, lifelike prosthetic has helped countless patients regain their smile confidence after tooth loss. Dentures are prosthetic teeth attached to a base that looks like healthy, pink gums. People who have lost all of their teeth in the upper or lower jaw will benefit from a full denture. This replacement option is held in place using suction. A denture cream or adhesive provides extra security for a full denture. Like the name suggests, a partial denture replaces missing teeth when some natural teeth are still present in the gumline. The partial denture fits in with the surrounding teeth like a missing puzzle piece. A removable denture can also be supported by dental implants. The premier option in tooth replacement, dental implants cost more upfront, but they also stabilize your jawbone and promote oral health for decades. Dr. Goodman will evaluate your candidacy for implant dentistry and help you determine the tooth replacement that is best for you. Whether your denture is full or partial, there are some maintenance steps that are needed to keep it functioning properly. When properly maintained, a non-implant supported denture can last for five to seven years before it needs replacing. Tooth replacement with dental implants, on the other hand, can be expected to last for the wearer’s lifetime. You should brush your denture at least once a day. To fully remove plaque, bacteria, and leftover food particles, soak the denture in a gentle denture cleanser at night. Be careful when handling your denture outside of your mouth -- placing a towel on the bathroom counter can help protect it from any accidental drops. Continue to regularly brush and floss any remaining natural teeth. If you have lost all of your teeth, use gauze or soft toothbrush to clean your gums, tongue, and the roof of your mouth every day. Notify your dentist if your denture becomes loose, rubs a blister or sore in your mouth, or otherwise starts to lose its fit. 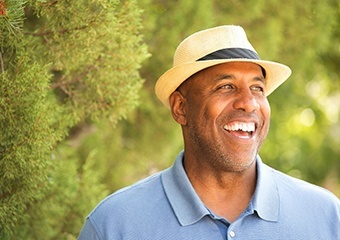 A properly-fitting denture is necessary for your continued health and wellbeing. With a full or partial denture, Dr. Goodman can help you enjoy a complete smile after tooth loss! You deserve to smile with total confidence. Let’s discuss your options in tooth replacement -- Dr. Goodman is the dentist you’re looking for when you search “dentist near me,” so give up the search and call us today!